2018 Greater Lake County Bowling Association 25th. Annual Senior Singles & Doubles Tournament. 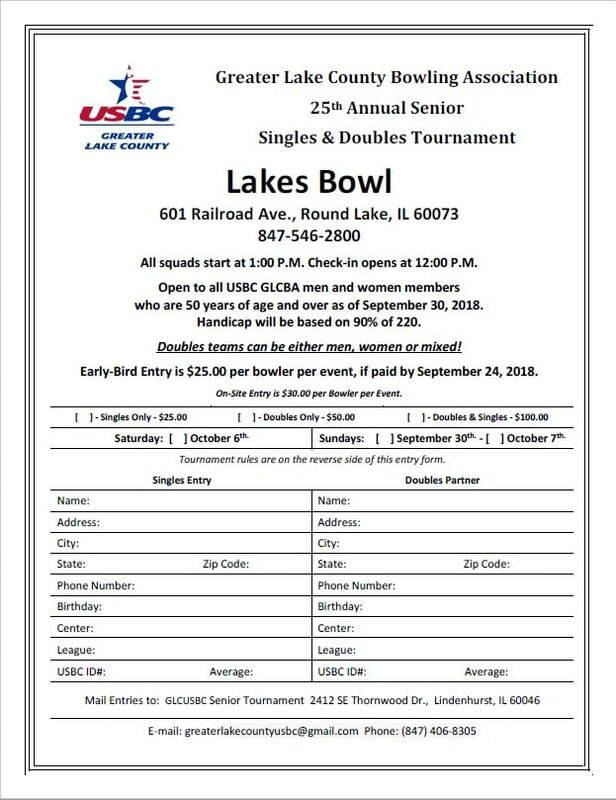 Lakes Bowl will host the associations 25th Annual Senior Singles and Doubles tournament Sunday September 30th, October 6th, & 7th, 2018. New for the 2018 season this event includes a Women's division in Singles, Doubles Teams to be Mixed and an early-bird entry fee of $25.00 per bowler, per event. This is a handicap event for all bowlers 50 and over. The singles event will feature two divisions for bowlers age 50-64, and 65 and older by gender. The Doubles is a single division event for all entries 50 and older. Entry for the early-bird entry is $25.00 when entry is paid for by September 24, 2018. Save time and postage! Lakes Bowl will accept your entry into this years event, no need to mail your entry form to the GLCUSBC office. This event has completed, please visit our Senior Tournament Results tab for more details.